MARRY THE NIGHT.﻿ A VIDEO TO REMEMBER. AMAZING.
" she told E! prior to the world premier of the much-anticipated video Thursday, referring to when she was dropped by her first record label, Island Def Jam. Directed by the Lady herself, the video starts off with the singer being wheeled along on a gurney by two Calvin Klein-clad nurses, her hair coiffed in a tousled brunette bob. "When I look back on my life it's not that I don't want to see things exactly as they happened," a robotic sounding Gaga says in a voice over. Gaga steps out in the next scene donning a bedazzled denim ensemble. "I did what any girl would do," she says in a voice over. "I did it all over again." Cue music. As the song finally begins (eight minutes in to the actual video), Gaga tries to sneak into a car through the sunroof while around her, abandoned vehicles burn in the night. Seconds later, she's in a dance studio, practicing her best pop-star moves along with a host of other aspiring dancers. 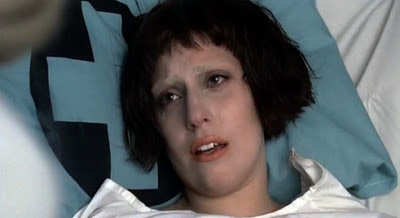 The rest of the video is pretty tame by Gaga standards, save for a few flashbacks to her freaking out in a bathtub. She dances on the streets while wearing blue lipstick. She tumbles down some stairs. She lights a few cars on fire. And then it's over. What did the wacky singer think about the final production? "It was intensely important to me that it was not too beautiful," she told E! "It was an incredible experience. It was amazing. It was absolutely amazing." Gaga added that the video's real message is about her marrying her own personal difficulties. "I am destined to struggle, I am destined to write music about the struggle, and I accept it willingly," she said.